While I would imagine that many Maryland Democratic candidates and their staffers are scrambling to find the devil in the details in Goucher’s latest 2018 gubernatorial poll, I’ll take a more simplistic approach in my analysis. Over 50% of Marylanders indicate they’ll vote to re-elect Larry Hogan to a second term. Hogan’s re-election isn’t what I would describe as a slam-dunk, at least at this point in the race, but the latest poll numbers are promising for Mr. Hogan – especially for a Republican governor in a deeply blue state, who also just so happens to be the second-most popular governor in America. Hogan’s popularity in Maryland is precisely attributable to his ability to build a consensus among Democrats and Republicans. The governor’s bipartisan approach has even won over many Democrats, despite the constant nagging from the progressive activist wing who desperately include Hogan and Donald Trump in every waking sentence. Hogan is popular among Marylanders because nothing about him is even remotely Trumpian – he is thoughtful; he’s pragmatic; he’s uniting; he’s not a sociopath, nor does he spend countless hours on Twitter waging culture wars. I would be remiss if I failed to mention that Larry Hogan is one of the nicest guys in politics. Democrats who incessantly stretch to tie Hogan to Trump should read the tea leaves more often. It ain’t working. I am convinced that while Larry Hogan’s re-election is certainly not a done deal (you would be unwise to believe so at this juncture), he’s riding comfortably in cruise control to November 2018. Barring any major gaffes or stumbles, Lawrence Joseph Hogan Jr., is likely to become Maryland’s 62nd [two-term] Republican governor. Write that one for the history books. Exciting as some of the Democratic outsiders (the newcomers to Maryland elected politics) may be – Krishanti Vignarajah, Alec Ross and Ben Jealous, just to a name a few – this cycle, Maryland Democrats are seemingly drifting toward some of the more conventional candidates, according to the results of the recent Goucher poll. Democrats who have an established presence in Maryland politics and who have been working the statewide political circuit for years (e.g., Rushern Baker and Kevin Kamenetz) could prove to be more formidable candidates against some of the lesser-known folks running. Bottom line: The race will come down to money. Which of the Democratic candidates can raise the most cash, and who has the best ground game? As it stands now, of the candidates currently running, Prince George’s County Executive Rushern Baker would get the nod. Why isn’t Kamenetz’s numbers higher? For several obvious reasons, but mostly because Democrats just don’t like him. More and more Maryland Democrats point to Kamenetz as the least likable candidate running. His campaign rollout left much to be desired and his standard stump speech is nothing more than a prolonged litany of complaints against Larry Hogan, delivered with the passion of a thousand rocks. You’ve all heard him refer to Larry Hogan as “Larry Slogan,” and you’ve probably all witnessed the collective eye rolls that follow. It would be unwise, however, to dismiss some of the fresher faces running as nothing more than peripherical players. Whatever you think of Krishanti Vignarajah’s initial announcement in August, her campaign kickoff and her subsequent statewide tour was a litany of serious policy proposals that didn’t include a whole lot of Hogan bashing. The only woman (at least for now) in the all-male gubernatorial field is making it known to the masses that she’s a formidable contender – a policy-driven, fresh-faced woman who isn’t afraid to take on the establishment. Quite frankly, don’t expect her to take any crap from any of the candidates. 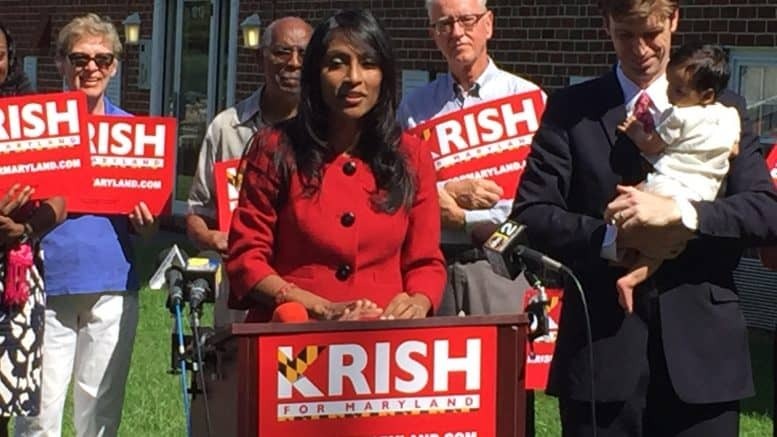 What’s the old Willy Wonka quote, “You should never doubt what no one is sure about.” While some voters may be unsure of Krish, don’t doubt her. Alec Ross is another burgeoning outsider candidate to watch in this race. There isn’t a Democratic candidate in the race who can sell a policy platform like the former Obama tech guy (a moniker he’s developed on the campaign trail that I’m positive he’d embrace). Ross’ education platform is impressive. I wouldn’t be surprised if Ross is dubbed as “the education candidate” moving forward – another label I’m sure he’d embrace. And Ross, like Hogan, is extremely likable. Ross is the kind of candidate you’d invite to sit down with you over a cigar and talk sports and cars. What impresses me most about Ross is his natural talent to sell tangible policies without resorting to the Kevin Kamenetz Captain Billy’s Whiz Bang playbook of Hogan insults. Eight percent of poll respondents indicated they would support state Sen. Rich Madaleno. What does this make Rich? A second-tier candidate? Maybe, but I say not. While I live in the progressive-activist cove that is Montgomery County, and I spend much of my time with some of the finest progressives in Maryland who adore Rich Madaleno, don’t for a second discount him as one of the backbenchers who cannot compete outside of his home turf. Madaleno is said to be the smartest Maryland politico running in the Democratic primary. Who else knows the intricate details of the state’s budget like Senator Rich? Which of the other candidates could even come close to Madaleno’s wonkyisms? Wait until the debate or the forums to watch Madaleno shine. While he hasn’t been shy in taking on Gov. Hogan, Madaleno’s criticisms of Hogan aren’t nearly as malicious and flagrantly annoying as Kevin Kamenetz’s constant barrage of insults and henpecking. Doug Ganlser…. Paging Doug Gansler. While he is not a Maryland political outsider, Doug’s presence in the race would be welcomed, I surmise, among Maryland Democrats. Gansler isn’t running for governor– for now, at least. Maybe Gansler has had enough of Maryland politics. Maybe he thinks he couldn’t beat Hogan. Maybe he doesn’t want to drudge up the negativity from his first go-around. Maybe Gansler is making some serious bread outside of politics. Gansler has his reasons for not running, but can someone – anyone – change his mind? The former Maryland attorney general should at least reconsider his options, I say. I have a unique appreciation for political wildcards. Gansler could be the wildcard in this race. But he’s not running. For now. My Republican (even some Democrats, too) friends are probably wincing if they’re reading this post, shouting, “But remember (insert negative story about Gansler from 2014).” That was then. This is now. Gansler now has a few years away from elected politics to rejuvenate and move past whatever happened in the 2014 Democratic primary. I sent Gansler an email this morning and told him he should run for governor. He thanked me. Look at the writing on the wall, Doug! Get in the race and run!